Oxygen Software updates Oxygen Forensic Suite 2012, the company’s flagship mobile forensic tool, offering investigators a greatly improved usability while providing access to even more information than ever. The newly introduced GEO Data bookmark enhances the Timeline section by presenting suspect’s activities accompanied with geolocation information in a single view. By grouping the activities by date, time and geographic location, investigators can quickly review suspects’ activities at a given time and place. 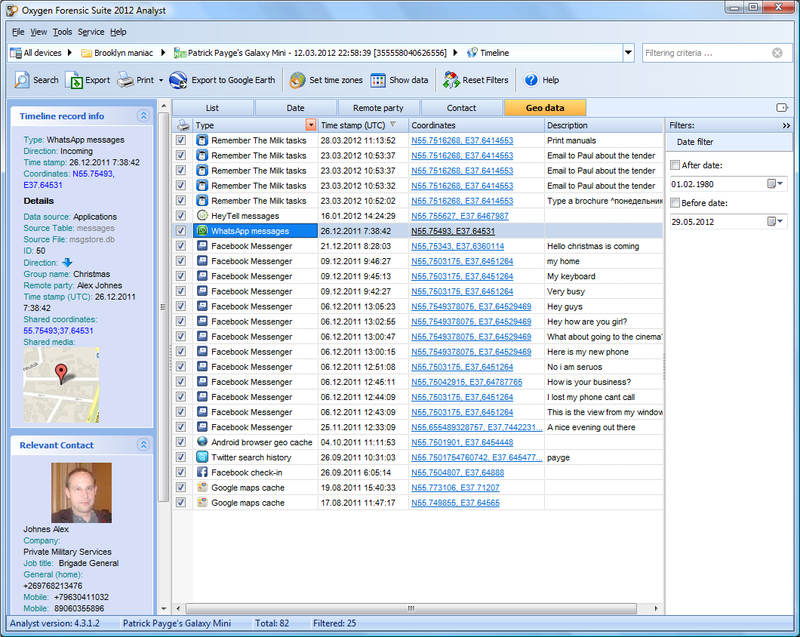 The latest release of Oxygen Forensic Suite 2012 introduces the ability to recover information about calls and messages deleted by the phone owner by analyzing raw data available in Event Log and Messages sections. The new feature provides investigators with side by side access to actual and deleted mobile and FaceTime calls, SMS and MMS messages, emails and iMessages. Finally, the updated version of Oxygen Forensic Suite 2012 provides enhanced support for BlackBerry smartphones, enabling investigators to access uploaded BBB backups or data extracted from a BlackBerry device in a single section. The newly added Source BlackBerry Tables section employs IPD Viewer to display BlackBerry database sources at a single location. In addition, BlackBerry Messenger contacts and correspondence can now be displayed. This entry was posted in News and tagged android forensics, forensic software, phone forensics, smartphone forensics. Bookmark the permalink.